Source: Ancestry.com: Passenger Ships and Images (see Source Information below)[1. Ancestry.com. Passenger Ships and Images (database on-line). Provo, UT, USA: The Generations Network, Inc., 2007. Original data: Various maritime reference sources. For about 1,000 ships there will also be an image of the ship (either a photograph or artistic rendering). Note: This database does not contain a comprehensive list of ships that ever sailed. Additional ships will be added to this database in the future. 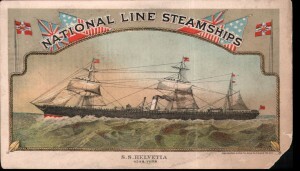 At the time the te Selle brothers sailed on the S.S. Helvetia, the ship was 371.5 feet long by 41.2 feet wide. These dimensions actually differ from the dimensions quoted by Harman Jan te Selle in Letter 2, where he states that the “ship was pretty big, measuring 460 feet long and 40 wide.” The reason for this discrepancy is unclear. Cobh (Irish: A Cóbh, pronounced “cove”; derived from English the cove) is a seaport on the south coast of Ireland, in County Cork, Republic of Ireland. The locality, which had had several different Irish-language names, was first referred to as Cove (“the Cove of Cork”) in 1750. It was renamed Queenstown in 1849 to commemorate a visit by Queen Victoria and so remained until the name Cobh (closer to the Irish spelling) was restored in 1922 with the foundation of the Irish Free State. Cobh is located on the south shore of the Great Island in Cork Harbour, (reputed to be the second largest natural harbour in the world), on slopes overlooking the harbour. On its highest point stands the Cobh Cathedral, St. Colman’s, seat of the diocese of Cloyne.] (Cobh) and New York on March 18, 1865. She started her last voyage on this service on May 25, 1871 and on July 11, 1871 commenced London – Havre – New York sailings. Rebuilt to 3,982 gross tons in 1872 and fitted with compound engines by J.Penn & Sons, London in 1873-4, she resumed Liverpool – Queenstown – New York voyages on October 14, 1874. In 1877 she was lengthened to 419 ft, 4,588 tons, saloon cabins rebuilt amidships, and with accommodation for 72-1st and 1,200-3rd class passengers. From 1877 to 1886 she continued on the Liverpool to New York service, and from 1886 to 1891 was used from either Liverpool or London to New York. Her last Liverpool – Queenstown – New York sailing started on March 26, 1891 and she resumed London – New York sailings on August 6, 1891. On September 8, 1892 she started her last voyage on this service and in 1893 was sold to French owners. She was abandoned and lost off Cape Finisterre in April 1894, while on voyage to shipbreakers. We are glad you found us. Are you looking for a particular person? Check the Profiles page. Read about the TeSelle family origins in Winterswijk, Netherlands. Learn about this bilingual website, how it is organized, who created it, and how you can help it grow. Enjoy! Will you share your pictures, documents, stories, and other TeSelle memorabilia with us? Those memories will fade with each passing generation. Please see the “How Can I Help” page for details on how to submit your memorabilia, and for other ways you can help us grow this TeSelle Family website. © 2019 Te Selle. All Rights Reserved.